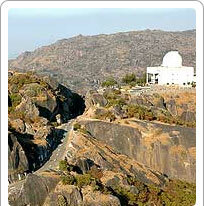 Gurushikhar or the Teacher Peak is the highest point in the Aravali mountain range. At 1722 metres, a climb to the top of this peak rewards the adventurer with a breathtaking view of entire Mount Abu with its Nakki Lake and other hills. There is an excellent road going all the way to the top. The peak has a temple dedicated to Guru Dattatreya after whom it is named. There was also a historic bell here from 1411 AD. That bell has disintegrated and has now been replaced by a new one. The short trip to the top of the hill is one of the enticing sightseeing trips that can be taken during a relaxed holiday in scenic Mount Abu.